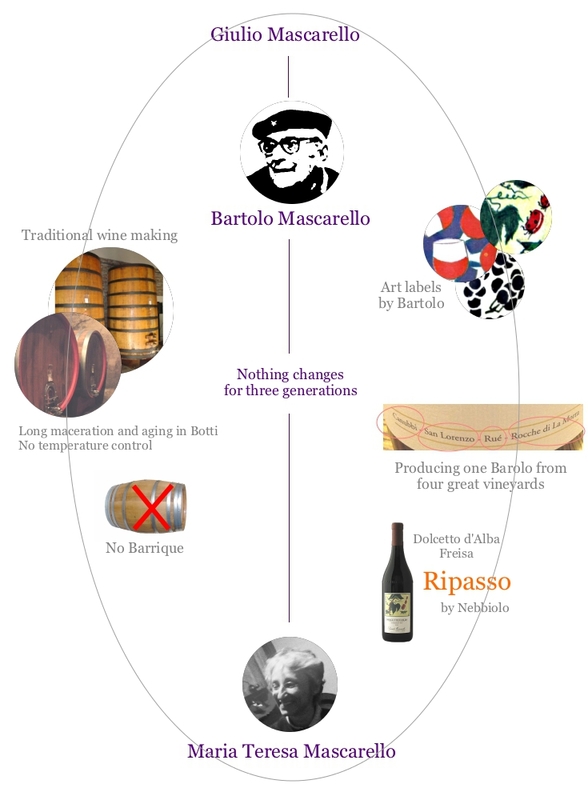 The wine of Bartolo Mascarello is living legend in Barolo. For three generations - Giulio - Bartolo(1927-2005) - Maria Teresa - nothing changes in the process of wine making and philosophy. Wines are vinified in Botti(large old barrels of local oak and chestnut) without temperature control, and they never use barriques. The Barolo is made by blending of 4 great vineyards such as Cannubi, San Lorenzo, Rue and Rocche di la Morra(like a Grand Cru in Bourgogne). Freisa and Dolcetto d'Alba are produced by traditional way of "Ripasso" by Nebiolo(Nebbiolo). In the late 1980s and early 1990s international and Italian wine journalism had began to criticise traditional Barolos and promote dark wines with coffee and vanilla flavoured from ageing in new barriques. Mascarello became the denomination’s guardian of traditional Barolo, as he clung tenaciously to the methods taught to him by his forebears. Bartolo Mascarello created a special hand-painted "No Barrique, No Berlusconi" label and he explained: "No Barrique, because I am against the use of barriques in Barolo – I am a traditional producer. No Berlusconi because I don't like his type of politics." The original hand-painted labels are now a much sought-after collectors’ item. Mascarello had a loyal core of customers from around the world throughout his career, also started to receive critical acclaim. The Italian wine world was shocked and thrilled when his wine received recognition in 2002 by the leading Italian wine guide, reversing years of criticism. - Time passed, and today the Modern style wine booming is over, and the wine culture gained diversity and depth in advanced countries. Mascarello's wine is recognised as a purest and most beautiful Barolo. Ironic and witty, he declared shortly before his death: "As the time came to change oak casks I made sure that every corner of the cellar was filled, so that when I die there would be no room for barriques". After his death his daughter Maria Teresa took over running of the winery, following her father’s traditional methods. She eschews marketing or promotion and does not have a website. 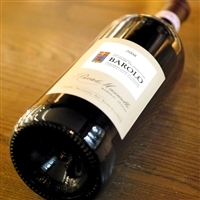 [Magnum 1500ml] A sweet, open bouquet leads to dark red fruit, mint, spices and licorice in this pretty, nuanced Barolo. The 2008 is all about detail and understated finesse. It boasts breathtaking purity in its fruit and fabulous overall balance. A textured, finely-knit finish leaves a lasting impression. RP96+ [Magnum 1500ml] The bouquet opens to plush flavors of red fruit and cherry with grilled herb, tobacco and mineral delineation. Its structure is yielding and round and the finish is ripe with soft fruit flavors. Make no mistake, it doles out complexity and an ethereal sense of balsam herb, cola and licorice that is the hallmark of this historic estate with a tiny garage winery in the town of Barolo. RP94,WE94,WS93 Generally Barbera is recognised as casual wine, but a few producer can produce Barbera as a great wine. One of the top quality Barbera with long ageing potential. Please keep several bottles for the future. Cannubi 50%, and making process is same as Barolo except for shorter aging period. Freisa is a local grape varietal in Piemonte and it is considered as roots of Nebbiolo. Produced by traditional method Ripasso by Nebbiolo. Lightly sparkling. Something special.